Abalimi and Harvest of Hope is about food security for all. 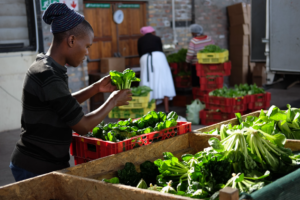 Focused on feeding our children, Harvest of Hope has partnered with three schools and a local library in nearby townships to provide fresh and healthy vegetables purchased by donors. This two-fold gift supports a farmer and feeds a child, and is quick and easy as part of your order. We have a strict no-waste policy and make sure no carrot goes uneaten. To learn more or suggest a partner recipient, please contact us. Purchase a bag for one of our charity locations and we will pack and deliver for you! If you going on holiday, then we can change the drop off location to our charity locations for a week or two then switch it back to your location when you return! 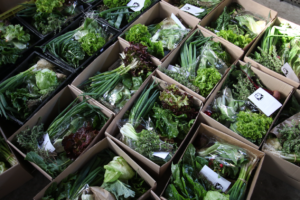 We pack and deliver each week the same high-quality vegetables you and your family enjoy. The Dalukhanyo (meaning `to bring light’ in isiXhosa) Pre-school is one of the few nursery facilities in the Langa Township. The school was established in 1986 by some of the local hostel dwellers, who identified the need to provide a play group facility in the community. In 2006, through continued request and petitioning by the management committee of the school, local government provided a prefab school structure. This is a very good structure, consisting of a large classroom, smaller class rooms, a small kitchen, and very good child and adult ablution facilities. The preschool also has some outdoor playground equipment. The school currently accommodates approximately 185 children. The children are split into four age groups. The nursery currently has thirty-seven 3 to 23 month old babies, under the supervision of two dedicated staff members. Fifty-eight toddlers (approximately 2 years old) have an adjacent space with two teachers. Fifty 3-4 year olds and forty 5-6 year olds share a classroom with their four teachers. 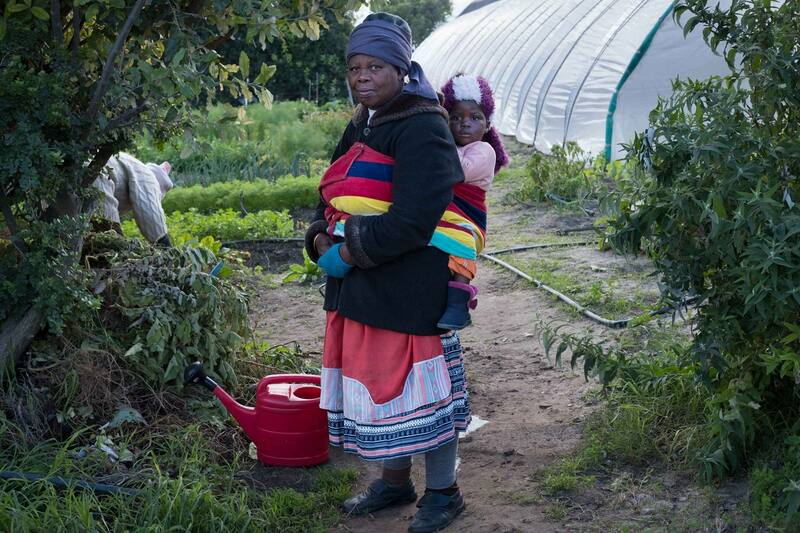 Since October 2011 the Langa Township Pre-School Trust has been purchasing weekly boxes of vegetables from the Harvest of Hope project. These go to the Dalukhanyo Pre-School and latterly to the Nomonde Pre-School, respectively 10 and 5 boxes weekly. This gives nutritious food to 240 children. One cook has said that some children come to school with signs of malnutrition but six weeks of her vegetable soups sorts this out. This facility provides support to those in need focussing on Hanover Park youth. No additional information may be provided due to safety of residents. The new Crossroads Library is bigger and more modern, with additional study and meeting spaces within a larger complex, training rooms, and education and business support services, thus creating a more collaborative and improved learning environment. It also has a more spacious children’s library, study area, teen zone and more accessible information technology services such as SmartCape and free wireless internet (Wi-Fi). Services include story telling, educational and literacy programmes. The HOH team heard from the librarians that the children come and spend all day at the library without lunch or dinner. Worried about the children being able to learn we decided we need a partnership. The library will continue to feed their minds hungry for more while we help feed their bellies. 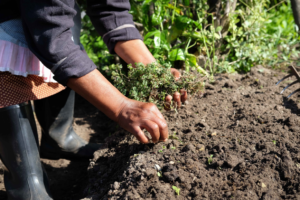 While we wish we could give away more veggies (and many of our farmers do), we need sponsorship of vegetables too. Please help us, help the librarians, feed local children. We know that these are the healthiest and most loved veggies in town. 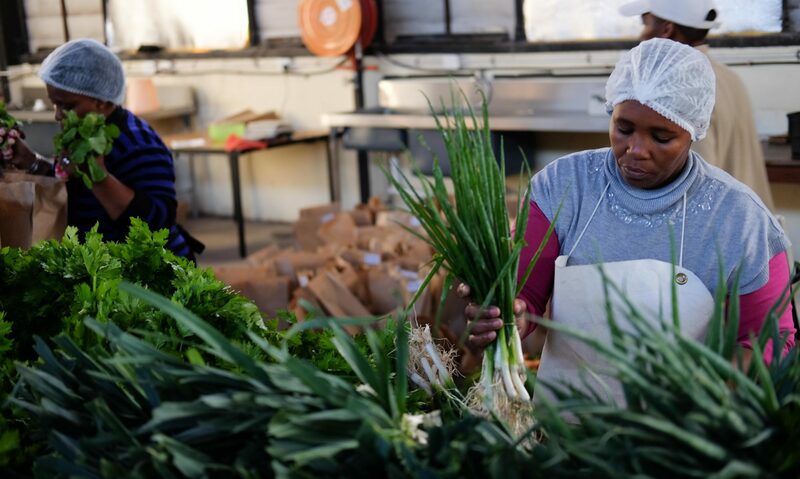 From all of us at Abalimi and Harvest of Hope, thank you for ensuring children in townships are eating a healthy meal!